A machine operator was fatally injured while he was attempting to bleed trapped air from a hydraulic cylinder located on an automated forming machine. The injuries occurred when he opened a bleed-to-atmosphere type air-bleed valve located on a hydraulic cylinder, causing high pressure hydraulic oil to be injected into his hand. The Fluid Power Safety Institute's unofficial accident analysis and opinions are based on discussions with the maintenance personnel, and an inspection of the machine. a. The operator attempted to bleed air from the system. This should have been a maintenance responsibility. b. No Job Safety Breakdown (JSA), or Job Safety Analysis (JSA) was written for this procedure. a. The process for ensuring that employees have received proper training and reinforcement is inadequate because several key elements are missing in the training process. b. Training of supervisors does not include key safety issues for this procedure. c. Air-bleed training was not specific for this job. 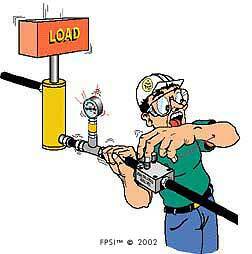 d. Maintenance personnel have only on-the-job training in hydraulics. e. Operators, mechanics, and supervisors receive no training in hydraulic safety. a. Similar incidents have occurred while bleeding trapped air from a hydraulic system. a. The operator had no experience with hydraulics, or any knowledge of how to safely bleed trapped air from a hydraulic system. a. Production demands were so high that, to save time, basic service and repairs were left to the operator. a. Manual bleed-to-atmosphere air-bleed devices lend themselves to this kind of accident. Even a trained person is at risk. Alternative air-bleed devices, such as automatic air-bleed valves, closed-loop ball-valves, or Safe-T-Bleed® should be specified. This type of accident can also be caused by the common practice of "cracking" high pressure connectors and/or transmission lines to "check" for pressure and/or flow. High pressure injection injuries of the hand (body) have been recognized by the medical profession as being devastating. Oil based solvents which include grease, hydraulic oil, and paint, are particularly hazardous. According to one of the studies I read, reported rates of amputation vary from 16% to 48%. TAKE THESE TYPES OF ACCIDENTS VERY SERIOUSLY! a. Train everyone who works on and around your hydraulic systems- this includes operators, supervisors, and plant managers. b. Only allow trained, authorized personnel to execute service and maintenance functions on your hydraulic systems. c. Include safety in machine specifications, i.e. design for safety. d. Have suitably qualified persons write Job Safety Breakdowns for all "special skills" tasks. e. Install "closed-circuit" pressure verification and bleed-down devices in all areas where energy can be stored in your hydraulic systems.